Imagine the best caramel dessert you’ve ever had. This tart blows it out of the water. It was developed by Julian Calcott, chef and co-owner of Brooklyn’s Cherry Point. The primary flavors here are syrupy, preserved walnuts and fudgy, caramelly Gjetost. The former brings holiday spice, the latter a sweet complexity, and they combine in a way that is almost unbelievably scrumptious. Because these ingredients have so much character, the filling of this tart packs an incredible amount of flavor in only five ingredients. It tastes somewhere between flan and pumpkin pie, yet somehow even better than both. 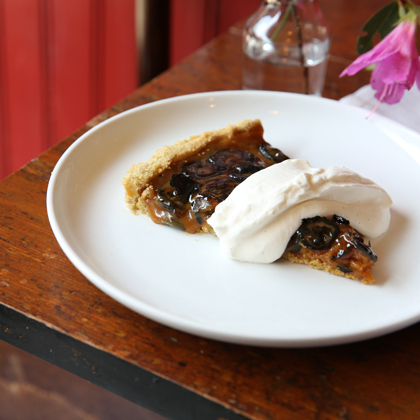 Dollop with some fresh whipped cream and you’ve got your new go-to dessert for wowing guests. Prep Time : 15 min. Cook Time : 20 min. Total Time : 2 hr. 30 min. For the Crust: In a blender or mixer, add the flour, salt, and sugar and mix until incorporated. Add the chilled butter and blend until the texture of wet sand. Add the eggs one at a time, blending until the mixture comes together. Stop blending once mixture is bound. If it is still crumbly, add iced water to bring together. Let dough rest in fridge for at least 30 minutes. Roll out dough on a heavily-floured surface until about 1/4 inch thick. Lay carefully into a greased 11 inch tart pan and press into corners. Cut off excess dough, leaving 1/3 inch overhang. Chill in freezer for 30 minutes. Preheat the oven to 350°. 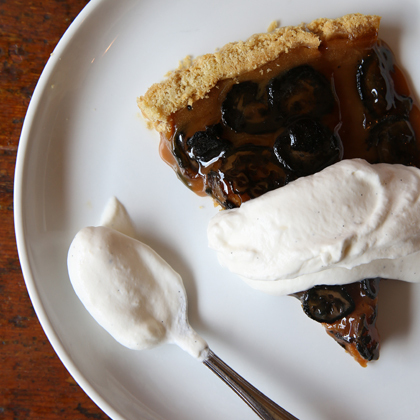 Remove the tart shell from the freezer, patching any thin parts or cracks with excess dough. Line the tart shell with foil and fill it with spare dry beans or rice, then bake for 20 minutes or until the edges are beginning to brown. Remove the tart from oven and take out the foil and rice or beans. Return the shell to oven for an additional 15-20 minutes, until completely golden brown. Remove from oven and let cool for 30 minutes. For the Gjetost Caramel: In a heavy bottomed saucepan, heat the cream and the sugar, until skalding. Add Gjetost and fold the mixture until smooth. Pour mixture into the room temperature tart shell and let it set by chilling in fridge for 45 minutes. Remove half of the walnuts from the jar. Separately, remove half of the liquid. Heat the liquid over medium-low flame and add the bloomed gelatin, keeping mixture warm but not bubbling. Slice the walnuts very thin, using a mandolin if available. Arrange the walnuts on top of the Gjetost-filled tart, then spoon the warm walnut liquid over the top, fully covering with a thin layer. Chill again for at least 30 minutes or until ready to serve. 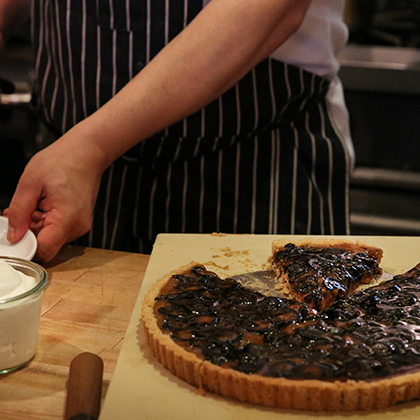 Slice the tart and serve with fresh whipped cream.